Petra the 2,000-year-old Arab city which is a UNESCO world heritage site. We joined a queue of tourists that would have taken hours to go through the gates anywhere else but here it only took 10 minutes. 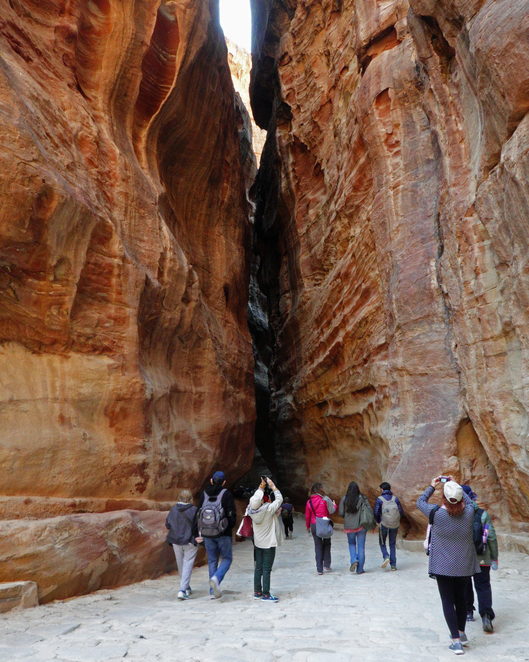 We walked the main trail of 8km as a group which took you through all the Hollywood moments: through the siq, past the treasury to the Roman theatre and the end of the road. You had to be careful of the uneven path and animal droppings from the carriages, camels and Bedouins on mules. We took our time listening to our guide's commentary so this walk talk took us till lunch where we all went our separate ways. Some of the group walked to the Monastery which was described as an extremely hard 2.5km walk. The path's steps are very uneven and old. By this stage the 10⁰c forecast felt like over 20 in our thermals so we opted to walk around the Churches, Royal tomb and through some Bedouin tents, shopping for souvenirs before getting on our 4pm bus. We had spent around 7 hours there and if we had started earlier (it opens at 7am) and had better walking shoes, oh and less clothing, we could definitely do more. 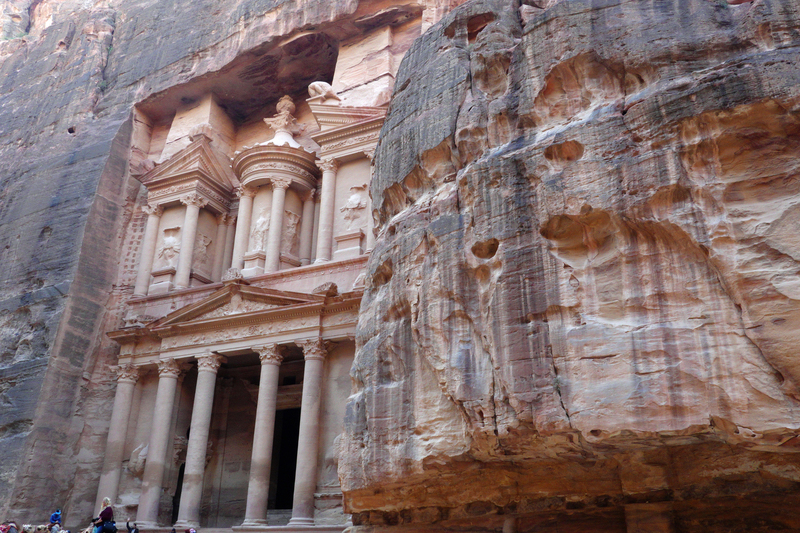 No photo will ever do Petra justice, it is a beautiful place. The historic site is rather large with many paths to choose. The higher you go the better the view but in the case of Jordan the more dangerous the path may be. You could see from the ground the missing steps and faded path as people were walking high up the walls of Petra and to be honest with you I was not game to try. We stayed at the Hayat Zaman about half an hour drive from the site of Petra. The hotel was an old village and our room was actually a stone cottage. It was nice but a bit basic. The food and views were the highlights of the hotel. The hotel was about half an hour drive out of Petra. Is the only way to reach Petra, is to walk? If so, how long did 8 kms take? Thanks.